Start your full-service, high-quality publishing process today with a small down payment. The $35 is automatically applied toward your book publishing service -- no extra cost! Plus you receive a personal consultation with a publishing consultant, a manuscript evaluation, a team of book publishing professionals, free e-books, and much more. Outskirts Press is the only full-service publisher where you can start publishing with just a $35 down payment. Most other publishers require 50% or 100% of the publishing payment up-front. This is just the beginning of the benefits to publishing with Outskirts Press. You will receive professional guidance on the best publishing package for your book and you will get all your publishing questions answered and receive personal help getting started on publishing your high-quality publication. Your consultant will create a custom publishing profile just for you. Your custom profile makes recommendations for your book based upon your goals to increase your chances for success. Your profile is yours to keep. We will identify strengths in your manuscript and point out opportunities to improve it. Select manuscripts will also receive a free edit of the first 1,000 words. Even if your manuscript isn't done yet, we can help motivate you. Every production team includes your publishing consultant, your author representative, your book designers, your title production supervisors, and your production manager. Depending upon what optional services you order your team may also include editors, illustrators, indexers, marketing assistants, etc. You will receive instant and continued access to two free e-books, including our publishing guide, Publish Your Passion, and a bonus e-book, Self-Publishing Questions Asked & Answered, written by Outskirts Press president Brent Sampson. Plus author success tip sheets on topics ranging from proper book pricing to proper format selection. My experience publishing my first book, In Search of Mr Wonderful, The Journey From Myth To Madness, with Outskirts Press was, and still is, phenomenal! I have never been treated in such a professional, supportive and relaxing manner. My dream of becoming a published author came true this August and I have not stopped receiving compliments on the book and its custom cover design yet. Saying thank you doesn't seem strong enough to say and show how you have made me feel but it is all I have. Thank you, thank you, thank you! Wow! My books look amazing. Outskirts Press made my lifelong dream come true. From the very beginning, I felt like I was the important one in the process. From start to finish, my experience with Outskirts Press has been remarkable! I am really happy with the finished product, and all the helpful hints have been most useful. I am reading the daily emails containing lots of useful information on marketing. My book has only been out for a short time, but so far the public reaction as been nothing but positive. Thanks, Outskirts, for an incredible job! 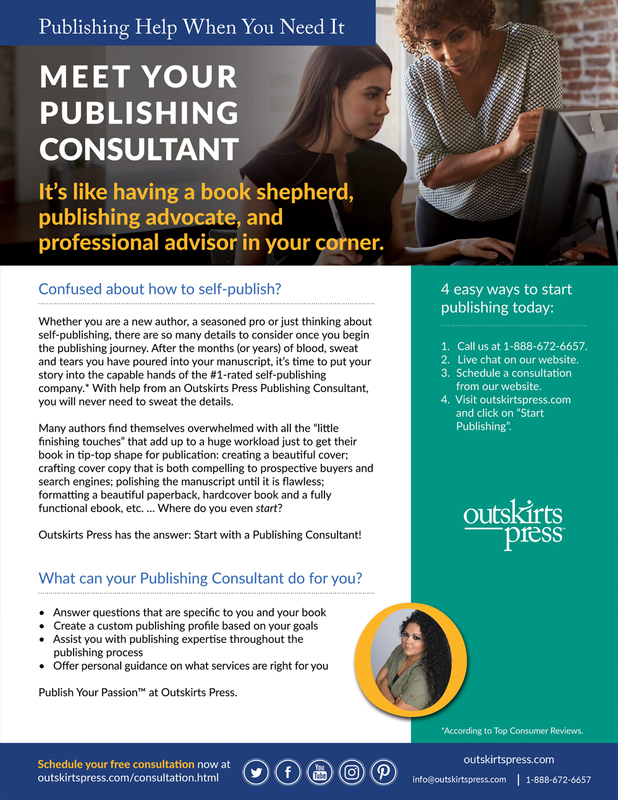 Outskirts Press is the #1-rated self-publishing firm because we offer high quality, customized self-publishing services with a la carte pricing flexibility. This means we have the most optional services in the industry, depending upon what package you select, and you only order what you need, without paying for what you don't.